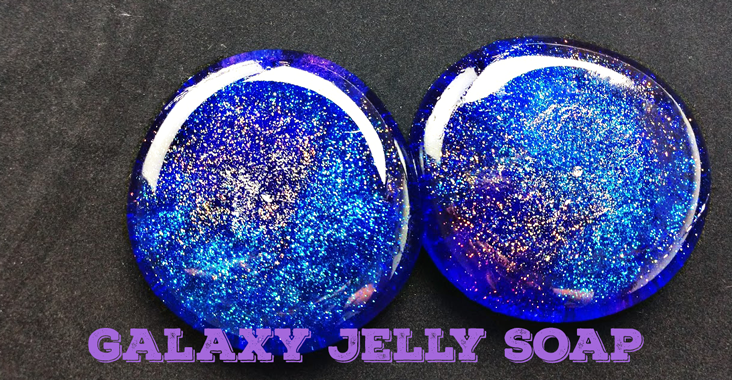 This brilliant, star-studded Galaxy Soap recipe elevates our Jelly Soap base to the next level. It is super simple to make, yet the finished product looks, pardon the pun, out of this world! 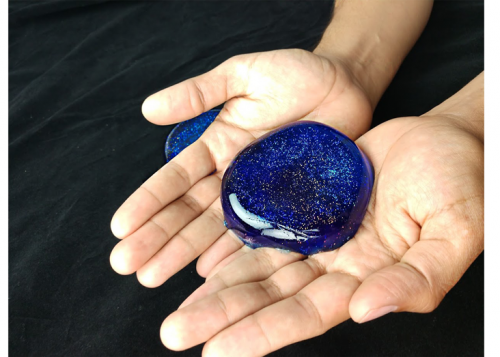 Using only a handful of ingredients, this tutorial teaches you how to transform our already awesome Jelly Soap Base into a mystical swirling galaxy! With the help of two types of glitter, a little color, and our new Volcano Capri Blue Type Fragrance. Give it a try for yourself and see how the glitters magically create the illusion of a million sparkling stars in a midnight blue galaxy. Heatproof glove or mitt for grabbing your heat-safe containers. Thick plastic jar, or 4-ounce double wall dome jar. Fragrance: Volcano Capri Blue Type F.O. Separate the soap into three parts and put into your heat-safe containers. Put the soap into your double boiler at medium heat and slowly melt. Once the soap is completely melted, add the fragrance at 1% to each of the split batches. 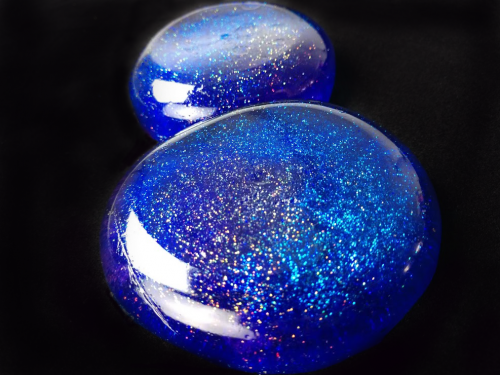 Add Blue Colorant and the Midnight Sky Glitter to one of the batches. Then add Violet Colorant and the Rose Gold Glitter to one of the other batches. Make sure it is nice and dark. For the final batch, you only need to add the Pink Colorant. For this next part, you will need to act quickly. Pour each color of soap into your jars one at a time in 3 parts. Quickly and gently swirl the colors barely enough to give it a cosmic effect. Finally, let the soap cool completely before you cover them and send them off to be sold. Using Both Glitters make the difference. We recommend using both glitters. They both reflect different colors, so the finished products appears to have billions of stars. Using a rounded dome jar makes this already shiny base look even more glossy and mesmerizing. Be sure to pour the soap hot, it will help with the swirling effect. However, always be careful when working with hot soap.